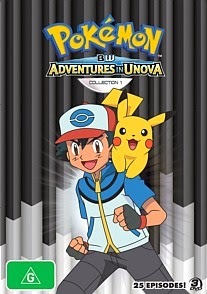 Thanks to our good friends at Beyond Home Entertainment, we've got 5 copies of Pokemon: Adventures in Unova Collection 1 on DVD to give away. Ash and his friends Iris and Cilan have foiled Team Rocket’s latest evil plan, and a new danger lurks on the horizon! But first, with eight Gym badges in hand, Ash is ready to take on the region’s ultimate challenge: the Unova League, where he’ll face familiar rivals and new opponents in his ongoing quest to become a Pokémon Master! Meanwhile, Iris has been having some trouble connecting with her powerful and stubborn Dragonite—can a visit home to the Village of Dragons help sort things out for the aspiring Dragon Master? And what exciting new adventures await our heroes beyond the Unova League? The answers to come, as the journey continues! Entries close 11:59pm on Sunday 23rd February 2014. Your details will not be used in any way other than for the delivery of your prize. Geek of Oz and Beyond do not take any responsibility for the loss, damage or delay of/to prizes sent to winners (blame Australia Post for that one). The judges decision is final and no correspondence will be entered upon. One entry per person, subsequent entries will be void. Incorrect answers will be void. Prizes are not redeemable for cash or any other kind of trading currency such as creds, latinum, sen, kan, zeni, double dollars or Ankh Morpork dollars. Geek Of Oz take no responsibility for head explosions caused by utter awesomeness. This competition is only open to Australian residents. Any questions or queries can be submitted through the comment section at the bottom of screen. Good luck!